So und weiter geht es mit ein paar Challenges. 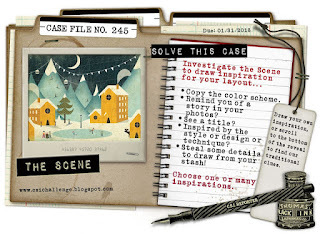 Des weiteren habe ich die Challenge von CSI - color stories inspiration genutzt. Die Vorgaben für die Challenges haben sich dort etwas geändert, aber ich habe mich trotzdem an den Vorschlägen orientiert. Die Häuser und die Berge des Bildes haben mir als Vorlage gedient. 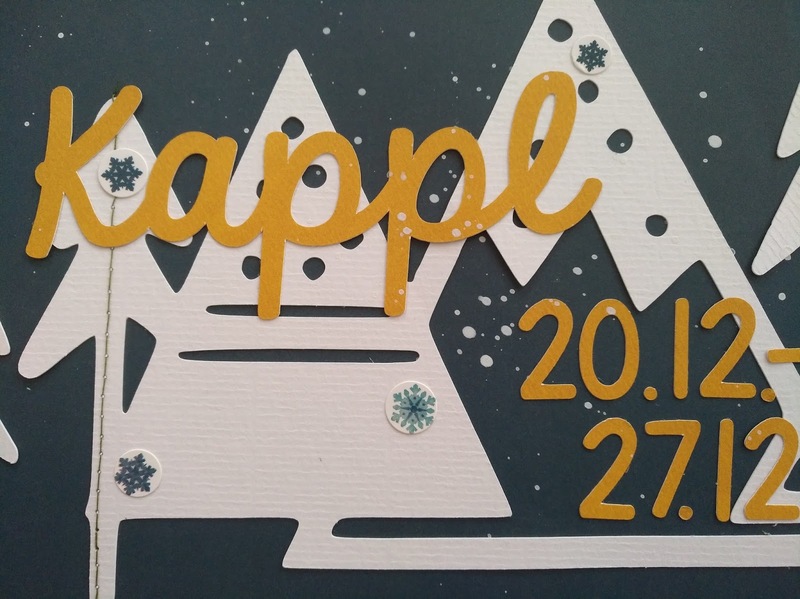 And I used from testimony: document a winter activity (we went to Kappl for winter vacation - this year, they had not very much snow at all). Bei Papier issues gibt es eine Take 5 -Challenge. Ich habe navy blue - triangles - washi tape - fussy cutting und stickers verwendet. At paper issues is a take 5 challenge online. I used navy blue - triangles - washi tape - fussy cutting and stickers. Zuletzt möchte ich noch an der Challenge bei Scrap our Stash teilnehmen: Winterthema und weiße Farbspritzer. 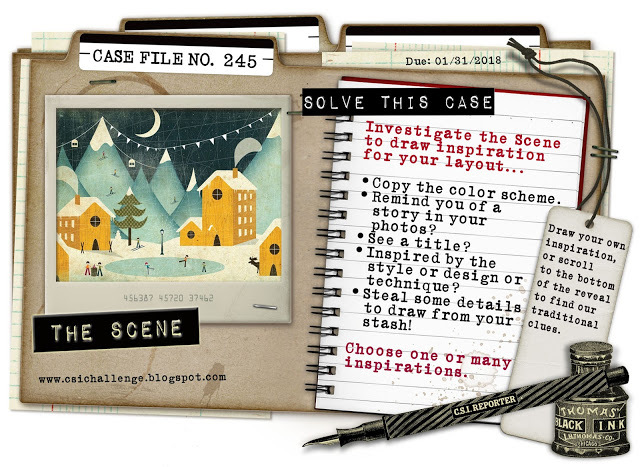 Last but not least, I want to join in the challenge of Scrap our Stash: Winter themed layout and paint splashes. Die Häuser sind Stempel von Lavinia, die ich auf weißen Cardstock gestempelt habe. Danach habe ich sie mit Polychromos-Stiften coloriert und ausgeschnitten. The houses are stamps from Lavinia, that I stamped on white cardstock. Then I colored them with polychromos and fussy cut them out. 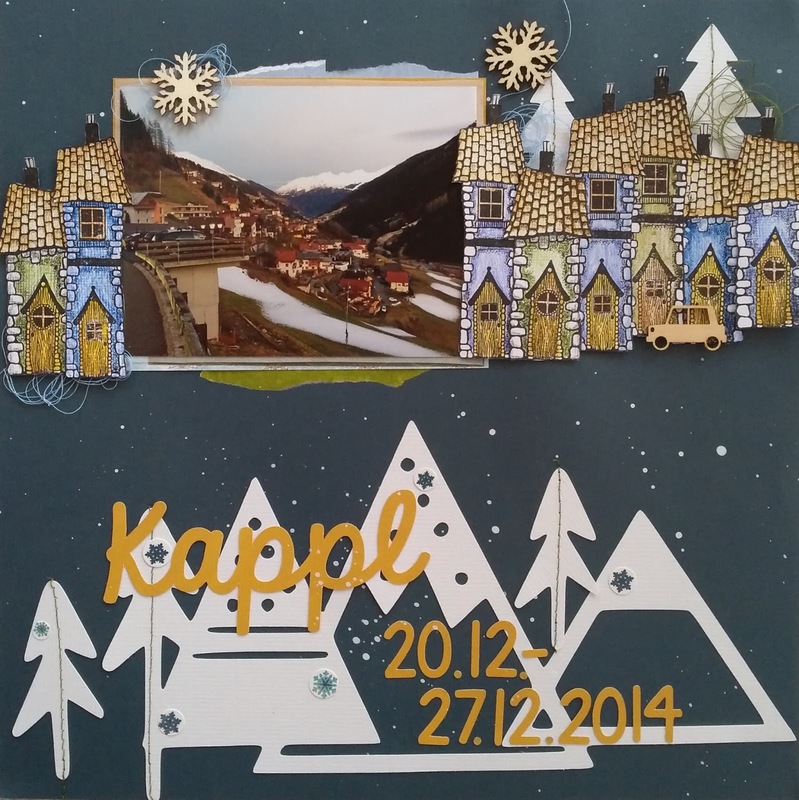 Die Datei mit den Bergen und den Tannen ist von the cut shoppe. Den Schriftzug habe ich mit der Cameo ausgeschnitten. Zum Schluss noch ein paar Embellishments und einige weiße Farbspritzer. 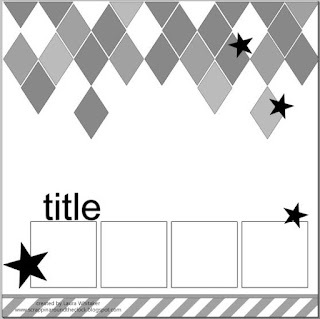 The cut file with the mountains and the trees are from the cut shoppe. The Title is cut with my cameo, too. Finally I added some embellishments and some white color spatters. What a beautiful page. Love the details and stash use. 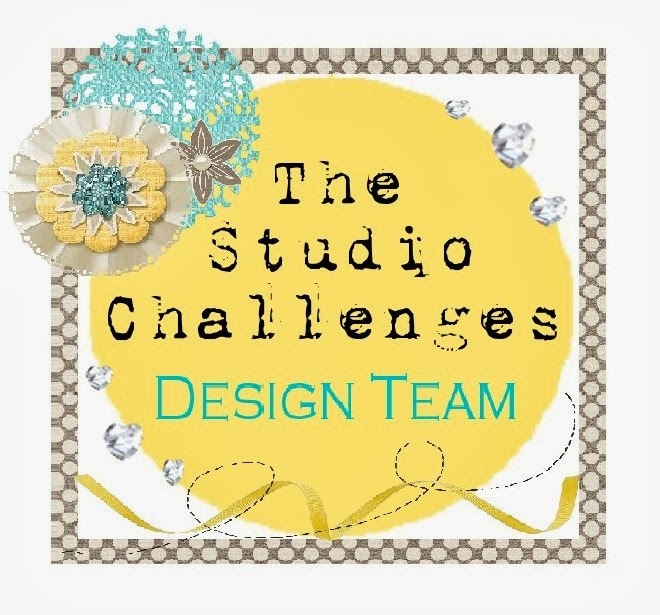 Thanks for your entry in our challenge at Scrap Our Stash Blog. Happy Scrapping! 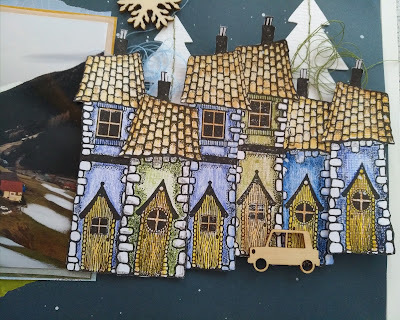 A brilliant page with the colourful stamped houses and the snowy scene. Thank you for joining us at Stuck?! Sketches! Such a great idea with the stamped houses. Fabulous take on the sketch! Thanks for playing along with us at Stuck?!Sketches! Fantastic take on all of the challenges! Loving that little village you created! So happy to have you playing with us at CSI! I'm loving those little houses. Not only the stamps themselves but also the way you coloured them. They frame the photo beautifully. Thank you for joining us at CSI. Totally gorgeous, those houses are wonderful and your placement so creative! Thank you for joining us at Stuck?! Sketches. Great take on the sketch, love the little scene you have created! Thanks for joining us at Stuck?! Sketches! Awesome little houses! Perfectly compliments your photo! Great solving of the case!TFS at CSI! Fantastic winter themed layout! I lve the little houses! Thanls for joining us at Scrap Our Stash this month. Great winter page - I love those houses! Thanks for playing along with us at Scrap Our Stash! Great take on the challenge. Love your stamped houses. Thanks for joining us at Scrap Our Stash. Beautiful layout! Thanks for playing along with us at SOS!